I haven't yet tangoed through a summer, so it's a very recent discovery that, even in a climate as untropical as Wellington's, if you have 50 people dancing in close embrace on a small floor, the temperature fast goes through the roof. Mine, anyway. Right now this feels like as big a challenge as was learning to dance backwards in high heels at the beginning of the year. As a general rule, I don't sweat. I wish I did - it might slow down the overheating process. But get me clamped (however nicely) in someone's arms, with the right side of my face against their head, and we're almost instantaneously glued together. Men, by and large, do sweat. Plus, as leaders, they must work damn hard. So, after one tanda, I leave the floor with my hair plastered to my scalp, and my face damp, and an unbecoming scarlet. Longish hair is therefore a problem. Last Sunday, P paused, mid-dance, and plucked some of mine from the region of his mouth. I didn't feel great about this, so last night I pulled it back into a ponytail. Which is cooler for me, too, since it isn't hanging down my back. It's ... um, a very long time indeed since I publicly accompanied a ponytail. From babyhood, my hair was chopped to just below ear-level, parted on the left and the right captured in a ribbon. 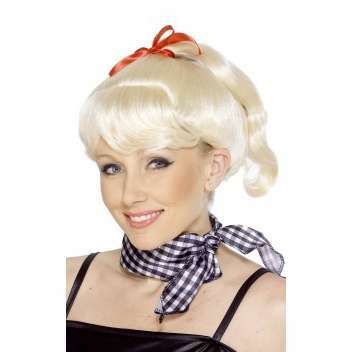 The classic 50s girl-child look. Then, one day when I was about seven or eight and was going to the church fete, my mother announced that my hair was long enough for pigtails. With a degree of pulling and pinching, she managed to scrap it into two stubs and secure them with rubber bands (that's right - scrunchies had yet to be invented). She called my father to admire them, as I stared awestruck into the mirror above the fireplace. From then on we were growing my hair. (If you knew my mother, you would understand that she was commander-in-chief of this project while I was a mere foot solider.) I progressed through plaits, and then, after intensive lobbying, was finally - around the age of 10 or 11 - allowed to graduate to a ponytail. Sadly, it was by then too late for one of those perky little numbers so beloved of 50s girls. My hair was too long and straight and heavy. I would lie on my back over the edge of the bed so that head and hair hung nearly to the floor, then, as if taking my hair by surprise, could corral it all into the rubber band. I would get to my feet convinced that this time I had done it - got my ponytail to bounce on the top of my head. But within minutes it had slipped from ponytailness to horsetailness. I came to hate it, and my thirteenth birthday present was being given permission to have it cut off. But that's another story. One of things I hated back then, apart from lack of ponytail perkiness, which was closely correlated with popularity, was that girls sat behind me in class playing with it and boys whizzed by in the corridors and playground and pulled it. Both, from a position of rock-bottom self-esteem, I interpreted as a subtle form of disdain, if not downright mockery. How lovely it is to grow up! Last night at the milonga two boys pulled my ponytail and not for a second did I think that meant they hated me. Hmm, not sure about this! Do you LIKE having your hair pulled? I don't, not ever. "Pulled" is a bit of creative license on my part, Anne. In reality, more of a passing tweak. Which I don't mind at all. It's a form of greeting!